One of the stated aims of Renewal and Reform, the CofE's national vision and strategy* for the next generation, is to increase the number of people being ordained each year by 50%. In their (our!) own words - The Church of England is seeking an increase of 50% in the number of candidates for ordained ministry. This means an increase in numbers per annum from around 500 to 750 in the overall annual cohort. The Church is seeking both numerical growth and an increase in diversity within the cohort of ordinands so that it reflects the communities in wider society where the Church is engaged in mission, in terms of age, gender and ethnic and social background. Stats released last week give some background to what this might look like. I've not detected much response in the blogosphere as yet (Ian Paul, comments at Thinking Anglicans). I posted a few thoughts of my own the other day, and here are some more. 1. Firstly, great. Every time I come across someone who feels God is calling them into leadership in the CofE, I'm delighted. Not just because I know what a privilege it is, but also that it's a sign that God isn't quite done with us yet as a church. Whatever else is going on, God wouldn't be calling people into this ministry if we were making a complete pigs ear of it. 2. Increasing the number of ordinands by 50% will mean a rise of 150 in those ordained to paid full-time ministry to 450 per year. The average age at ordination is 41, add on 4 years for a curacy, and retirement at 65, and you have a long-term stipendiary workforce of 9000 clergy. That's 1300 more than we have at the moment. By the time we get to this figure, the UK population will have increased by another 10m to 75m, so there'll still be plenty to do. If the CofE succeeds in lowering the age profile, we may have closer to 10,000.
a) At the moment we are ordaining almost exactly the same numbers as those retiring from ordination. so whilst the main narrative around the drop in clergy numbers is retirements (25% of those in my diocese are due to retire in the next 5 years), there is another major factor. On average we ordain 290 people a year, 280 clergy per year retire or die, and another 300 per year leave to do Something Else. b) Something Else #1 2500 ordained clergy are in chaplaincies or other non-parish appointments. The CofE projections assume this will stay the same for the forseeable future. Why then do we train all clergy for parish ministry? Why is every curacy served in a parish setting? CofE training is front-loaded (2-3 years in college/theological course then 3-4 years in a curacy), and apart from the occasional specialist placement, the main focus of activity, training, and ministry models is the parish. This seems like a spectacular waste of resources on two fronts. Firstly that many of those thus trained will end up in a different setting to the one they were trained for, and secondly that the model is designed for a static society and ministry setting (what you learn when you're 25 will serve you well at 65). Spreading learning and training throughout ministry makes more sense, as it can be better tailored, and more responsive to context. c) Something Else #2 About 100 clergy per year leave the role before retirement, and we have no idea where they go or what they do. In other words, for every 3 people ordained, one will drop out. We may have to revise that 9,000 figure down a bit. If the attrition rate remains the same, there'll be 150 clergy per year dropping out if the ordination targets are hit. Some of these clergy are dropping out for health reasons, others for stress, others because (often stress is a factor) they've done something that makes remaining a vicar untenable. There's evidence that we could support clergy much better than we do, and my own experience is consistent with that. On more than one occasion I haven't been very far from becoming a clergy casualty, and each time stress and lack of support have been key factors. This resignation statement is from a US church leader, but would probably find an echo amongst many CofE clergy. d) We owe it to the future clergy we are praying for to look at what they are being called to do. There are attempts to simplify what the CofE does, but a do-able job description, realistic expectations from parishes, and greater sharing of ministry between lay and ordained are all vital. George Herbert may be long dead but his ghost still stalks the vestry of a thousand parishes, whispering of home communions and Morning and Evening Prayer, heard in echo every time someone complains 'the vicar hasn't visited'. I was stunned to hear the Herbert model advocated by a CofE college principal not that long ago. e) Digging still deeper, what about 'ministry' itself? The CofE claims to follow the historic pattern of 'Bishops, Priests and Deacons'. Sure, and I use the Book of Common Prayer every day. The role of CofE bishop is a long way away from the bishop/overseers of the New Testament, who were in team leadership of local churches. Deacons, with a handful of exceptions, are a holding bay for apprentice priests, it's what you are for 12 months after initial ordination. We still have only 1 full-blown licensed lay ministry (lay Reader), despite having lay gifts in evangelism, pastoral care, discipleship, healing, preaching, worship leading, organisational leadership, children/youth/womens/mens/older persons ministry etc. And by restricting leadership at communion to priests, promoting communion itself as the be all and end all of worship, and amalgamating parishes, we have created a situation where every Sunday hundreds of vicars are driving from church to church to wave wafers at small groups of people, whilst never having the time to have a proper conversation with any of them. There has to be a better way, and there has to be a better theology - of church leadership, of worship, of the church as the body of Christ and people of God. f) Before we invest a lot of money finding, vetting, training and deploying new ordinands, we need to invest some energy in looking at the system we are putting then into. How much investment is needed to support 1 vicar in post, to keep them from that one mistake which will potentially destroy them, their family and their congregation, compared to the investment needed to train up their replacement? Not so long ago, some parishioners of a clergyman I know wrote a letter to his Archdeacon, complaining about something trivial. Because they'd had it in writing, the Archdeacon told this faithful vicar that the Diocese couldn't offer him support, as they were now involved in a complaints process. I'm sorry but that's disgraceful. We must do better. I'm delighted that at last the CofE has woken up to the facts, and is doing something, I'm glad that before anything else we're being encouraged to pray. I hope that we let the dominoes keep falling - becoming a mission-shaped church will change our thinking about church, ministry, training, priesthood, and a whole host of other things. Historically, our thinking about church life hasn't been shaped by mission, so it shouldn't be a surprise if we have to rethink pretty much everything. Bring it on. *5 years ago this phrase would have been a cartoon caption. I still have to pinch myself that it's a reality, after years of wittering on about the fact we don't have one. In 2012 I wrote this piece about the future of the Church of England, especially its clergy. It remains the most viewed and commented article on this blog. I wrote: The stats project clergy numbers forward to 2016. I would suggest that someone needs to go further than that. 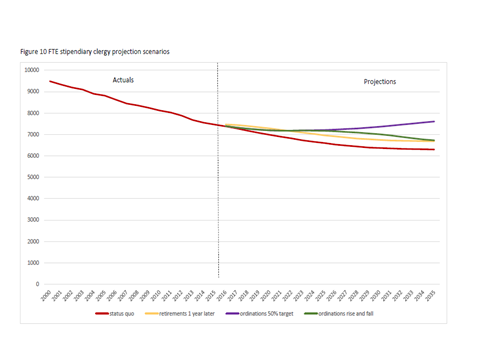 Well, if you wait long enough….. As part of the Renewal and Reform initiative, the CofE has now published stats on clergy numbers, projecting forward to 2035. It makes the case for the national CofE target of increasing the number of ordinands by 50% year on year. There are currently 20440 Anglican clergy. Of those, 7730 are paid and in parish ministry, 6500 are retired but still active. 3300 are ‘self-supporting’, i.e. ordained but not paid by the church. What caught my eye is that 2670 are either chaplains or in ‘other’ posts (Christian agencies, tutors, non-parish appointments). On average, 285-90 are ordained to stipendiary ministry, and 260 retire from it. 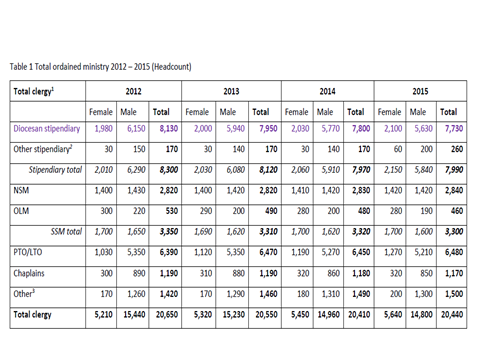 So you’d think clergy numbers would be going up, but…..
Another 300 people a year leave stipendiary ministry – half to other clergy roles (and half this number also rejoin parish ministry from other roles) like chaplaincies, diocesan posts etc. A further 10% take early retirement, 9% go to unspecified roles, and 25-30% each year are ‘unknown’ – i.e. they disappear off the radar completely. I note in passing that if the 90 a year who leave parish ministry were retained, this would be a equivalent to a rise of 1/3 in ordinations. I don’t share Linda Woodheads agenda for the CofE, but she did a very useful piece of research back in 2014 which showed that 49% of clergy felt the CofE was ‘Bad’ or ‘Quite Bad’ at supporting their skills, gifts and initiatives. I wonder if there is a connection. - Status quo – no change in current figures for joiners, leavers, age profile etc. - Retiring later – clergy retirement age rises 1 year (pretty realistic, it would now make much more sense for me to retire at 68 than at 65). - Increase of 50% in ordinations from the current average, and the age distribution of females matching that of males (i.e. more younger women), sustained long term. - 50% increase up to 2023, then a fall back to current levels. The worst scenario (status quo) gives us 6300 stipendiary clergy, the best (sustained increase) means we hold steady–ish at 7610. With more people going into training, there’ll be a higher percentage of curates than at present (23% to 14%). 66% will be ‘incumbent status’ – i.e. there’ll be 5022 vicars. “the scenarios presented address those aspects that seem most likely or can be influenced by policy decisions” says the commentary. a) The number of stipendiary ordinations fell from a high of 700 around 1960 to 300-350 in 1970, and has stayed in roughly that range ever since. Why has it taken 45 years to respond to this? c) The average age at stipendiary ordination is 40. These are the ones who will end up running a parish (we have 13000 parishes). If average retirement age stays at 65, that’s an average 25 years per person. So we’ll need to replace 1/25 of the workforce every year just to hold steady. Currently that would mean 309 ordinations a year, which is actually only a 10% rise on what we’re doing. d) But: 2670 clergy are currently in chaplaincy or other non-parish appointments. The projections assume no change in that – i.e. we will continue to have to ordain enough people per year to maintain this figure. Based on the 21 year average working life after a curacy, that’s 127 stipendiary ordinations a year to maintain chaplaincies, agencies, dioceses (our diocese currently has 11 clergy on its paid staff). Could we do more to promote lay ministry in posts currently held by clergy – Archdeacons? Chaplains? e) And the other issue not addressed is the drop out rate, with nearly 100 people leaving stipendiary ministry each year and either retiring early or leaving paid ministry altogether. I could reel off quite a list of clergy I know who have burnt out, dropped out, stressed out, or (often under pressure) done something which has made their ministry untenable. Compared to, say, recruiting and training an extra 10 people per year, how much does it take to retain 10 people per year? If the current figures merely flatline ….. each full-time vicar will be looking after an average of 3 church buildings in 2.5 parishes containing 10,000 people between them, with 200 regular (once a month or more) worshippers. They will take an average of 29 baptisms a year, see 5 new people confirmed, take 12 weddings and 34 funerals. Less than half of them will have any kind of informal meeting space, toilet facilities, or kitchen facilities within church premises, which will severely limit their ministry to the community. And they'll each have roughly 1 CofE school, no doubt with a 'tradition' that the vicar is chair of governors. Oh yes, and they'll be encouraged to develop 'fresh expressions of church' as well. We need to devise a way of being the CofE that can function with only 5000 full time staff, alongside the small army of volunteers, lay ministers and unpaid clergy. And we need to work out whether the paragraph above is a realistic job description. We need to look at both recruitment and retention. And we need to look at what we are recruiting people to. I forgot to add church councils to the above description (4-6 meetings pa per parish, plus AGM, and trying to recruit 2 churchwardens, secretary, treasurer, safeguarding officer, H&S officer in each church). How can we make the job less of a burden, whilst providing more support? If half of clergy don’t feel that their diocese appreciates or supports their gifts and skills, then surely we need to look at how we help the current crop of clergy to thrive and survive, as well as how we add to their number? At the moment the system is buttressed by 6500 retired/non-active clergy who, with 'permission to officiate', keep the show on the road. Just as we have a blip of retirements coming up, so we will have a blip when God finally retires his servants and they join the heavenly chorus. By 2035, we won't have as many retired clergy either. And we shouldn't have a system which depends on them in any number, whether it's 6 or 6000. Update: One final thought, if the CofE is planning on the 2500+ in non-parish ministry continuing, why are we still training people as if they will all end up as vicars? That is a massive number who are trained for one thing, but end up doing something else. We are either wasting a big chunk of our training budget, or at the very least misdirecting it. A new series of short films from the CofE, on the thinking and vision emerging for the renewal and reform of our national church. "They wanted to know 'if Jesus is real, how can we get to know him?' I used to wonder if it was possible for the CofE to have a coherent, Christ-centred vision for its work, given the diversity and culture of the thing. How exciting to be proved wrong. The second of our four films themed on the vision and narrative. The Bishop of Burnley is joined by Youth Council representative Alexandra Podd, and Archbishops's Council member Rebecca Salter, in looking to a hopeful future. In the third film in our Renewal & Reform vision and narrative series, Programme Director Mike Eastwood, and Area Dean Kate Wharton, look at the challenges facing the Church of England.